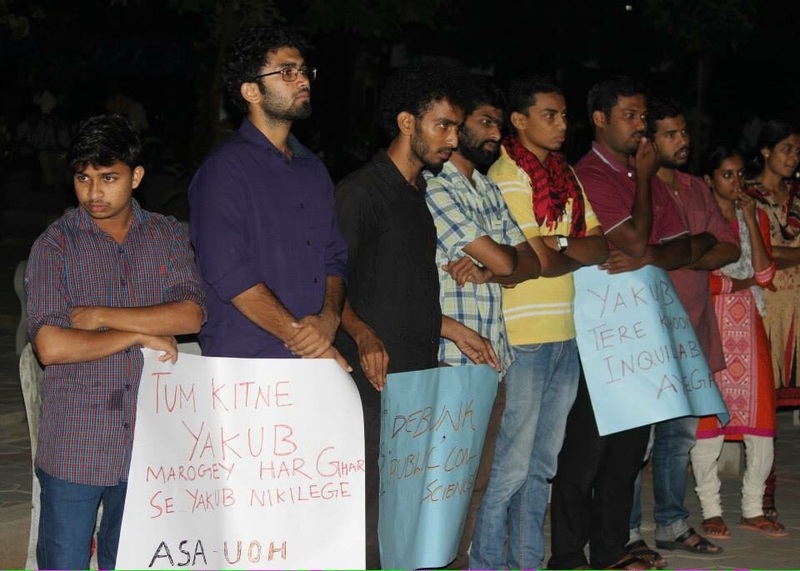 Will The University of Hyderabad Show Courage Against Radicals ? How many Yakub’s will you kill, one Yakub will arise from each home” . This was a poster not in a madarasa, but in the University of Hyderabad ( UoH) put up by ASA, “Ambedkar Students Association” of UoH. This was on the occasion of the Namaaz e Janaaza organised inside the campus of UoH on July 31st by the ASA and some radical Muslims. Some of them have studied in Jamia Milia Islamia earlier and many others come from radical Muslim families of Kerala. In protest against the anti national activities being perpetrated in the campus, the Akhil Bharatiya Vidyarthi Parishad , (ABVP ) unit of UoH planned to organise a protest on 4th August. 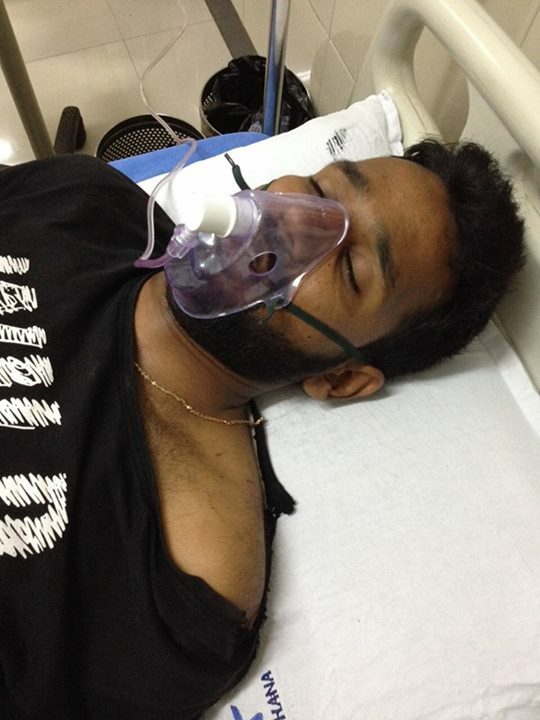 Sensing this, the president of the ABVP unit of the university, Sri Susheel was attacked by about 60 radical members in the midnight of 3rd August 2015; Susheel is hospitalised and has been having severe blood vomiting and lung pain since then. The Police, Administration and more importantly the Vice Chancellor have to take quick action against these hoodlums else this university of prestige will become a prey ! Those interested in knowing a background of these events, can read further down. This entry was posted in Nation, Threats and tagged ABVP, Ambedkar student association, ASA, Hyderabad Central Univerity, Islamic terror in campus, University of Hyderabad, UoH, Yakub Memom on August 4, 2015 by arisebharat. Vemula’s words are not aimed at anyone. Tragic and incredibly heart-breaking, it would do his memory a massive disservice if we turn him into a political football and kick him around to suit our narrow, blinkered ends. We feel greatly saddened to briefly report the unfortunate suicide committed by one of our research students Mr. Rohit Vemula, working for Ph.D. in Centre for Knowledge and Innovation Studies, under School of Social Sciences. Mr. Vemula is one of the five boys who were asked to vacate the hostel on account an incident that occurred during intervening night of 3rd and 4th August. Incidentally all five of them are Dalit students. It all happened when there was an alleged attack by a group of students in one of the hostels, on one student. Mr. Susheel, the then President of ABVP Unit in the campus was allegedly attacked a group of Students belonging to Ambedkar Students’ Association (ASA) during that intervening night. The Proctorial Board of the University has enquired into the matter and submitted a final report after talking to the victim. When the Executive council (EC) approved the punishment to expel five students (including Mr. Rohit Vemula who committed suicide), ASA students did not allow the University administration to function for two days forcing the then in charge Vice Chancellor Prof. R.P. Sharma to withdraw the order with a condition that the matter will be looked into afresh. A committee was constituted by Prof. Sharma but the committee replied back, after Appa Rao took charge at the end of September, indicating that the recommendations of the statutory bodies like proctorial board and executive council cannot be reviewed by such committee. Meanwhile Susheel (victim)’s mother filed a case in the High Court and the court was repeatedly asking the University legal counsel to inform the action taken on recommendations of the proctorial board. University has delayed submitting such action taken report with the hope that the court will decide things on its own. However, in November middle the court ordered the University legal counsel to submit the ATR with a few days deadline. Otherwise, the judge was taking the matter seriously. We then had a meeting of the Deans and administrative officers of the University in which at least three Dalit faculty were also part as Controller of Examinations, Chief Warden and Dean of Students Welfare. It was decided that in the given circumstances, that an EC sub-committee headed by Senior most professor in EC as Chairperson will examine the matter and submit recommendations. Since none of the EC members were from Dalit community, we have requested Dean of Students’ Welfare (Prof. P. Prakash Babu) a senior Dalit faculty member to be part of the committee to join the EC subcommittee since he is also a statutory officer of the University. We could give them very short time because the court deadline was so close. The EC sub-committee, after long deliberations and after consulting the University security and local police officers, upheld the recommendations of the proctorial board and recommended to the EC that the said five students be awarded punishment as recommended earlier. In the full EC meeting that was held one day before the deadline given by the court, it was proposed to the EC to be a bit lenient because the recommended punishment will deprive the students of the scholarships to continue Ph.D. after the one semester expulsion recommended by the proctorial board. As Chairman of EC, the VC had taken DSW into confidence, who expressed satisfaction over the proposal. The full EC agreed to VC’s proposal to be lenient but as a regular practice followed in the University for several years, it was indicated that these students will be permitted in the respective Department, Library and Academic meetings and not in the hostel, administration and other public places in the campus. The decision of the EC was submitted in writing to the high court by the University legal counsel. It was communicated to the students after the said EC minutes were approved by the members. First the minutes were posted on the University web and later formal orders were issued to the students. Chief Warden (also a dalit faculty) communicated the same to the students around 20th December and asked the students to vacate the hostel. He has double locked the room where required and submitted a report to the University. The DSW was in touch with the students. On behalf of the students, there were a group of students who met VC and demanded revocation of hostel suspension and started branding as “social boycott” order. They were linking this punishment to the letter from Honourable Minister Sri Bandaru Dattatreya (enquiring about the August 3/4 night incident) forwarded by MHRD. It was adequately explained to them that the letter received from MHRD or minister’s letter have no influence whatsoever in the EC decision. But, the students’ groups mostly belonging to dalit groups and SFI were bent upon branding it as involvement of BJP government, and RSS role in this matter. The five students expelled from the hostel moved high court seeking stay on the hostel suspension. High court judge did not agree to stay the punishment immediately but asked their advocate to club this petition with the one which is already in front of the court on the same matter and posted it for January 19, 2016. We understood the matter, therefore, as subjudice. Further, the earlier decision of EC in August 2015, was reviewed by the EC on an appeal given by the students. Hence, the decision of the EC as appellate authority can only be reviewed by the court was our opinion and maintained the same in our discussions with the students. All the five students suspended from hostel are eligible for fellowships. Two of them get regular JRF with HRA eligibility and the other three were getting non-NET fellowship. In fact one Mr. Sunkanna in these five students has even submitted thesis after August 2015. Although they were research students, they waited for the reopening of the University until Jan 4 2016 for a protest. “Sleep in open” was the protest chosen by them from 3rd Jan night. The students erected a small tent with all social leaders’ pictures on flexes and started sleeping at shopping complex in the University. Three of them were sleeping at shopping complex while one of them never joined for health reasons. Sunkanna, the one who submitted thesis, was also not part of the sleeping group. DSW was regularly discussing with these students and counselling them to have patience to know the court decision in this regard. Meanwhile, a student JAC including students union represented by SFI, with support of some faculty started mounting pressure on the University. On 13th January, when the regular VC was away, they closed down the administration building and did not allow the employees to enter. They demanded that the regular VC should come, revoke suspension and then only they will agree. I had advanced my return journey and reached campus on 13th night (cancelling appointments in Delhi) and called the meeting of the local EC members, senior Deans and DSW on the course of action to be taken. It was decided that there will be an oral appeal, followed by written appeal to the students to allow the administration to function. If the students do not listen, we have decided to take help from police. It may be noted that the class work was not affected on 13th and 14th January. On 14th morning, by 12.20 or so the allowed the employees to get in, when we issued written appeal and sent our security officer to local police station seeking formal help. We then agree that the VC would talk to the students JAC members along with the President of Students’ union. We had 2 hours discussion and explained our position and repeatedly told to them not to accuse the Government because there was no role of MHRD, HRM or even Sri Dattatreya. It was appealed to the JAC members that they should wait for the court decision. The expelled students were not part of this JAC. The expelled students continued to sleep in the tent. Today (Sunday morning) we realized that the JAC erected a tent and was planning to announce some form of hunger strike. VC, Registrar and DSW and other senior faculty were getting ready to face the situation as required. All of a sudden at 7.20 pm this sad news broke and the campus is now disturbed. The suicide note has no mention about this hostel expulsion incident or any other concrete point(s). It was more philosophical. University PRO was asked to send copy of the suicide note as attachment. The Deputy Commissioner of Police of our area suggested that DSW and VC should move out with family because the students may resort to some violence. This is in brief about the incident. In fact the students have attacked Security Officer, Deputy Registrar (Security) and DSW when they tried to reach out to the dead body in the hostel. Then all three have moved to VC lodge for next steps. We were together with Registrar and other senior faculty when DCP called us to move out of campus. Registrar is continuing in campus to take appropriate measures. VC and DSW are in touch with the DCP. 12 in the midnight of 16th January 2016. Prashant, it is very clear in the event poster(s) and name what was the purpose. You are deliberately misinterpreting. Your intentions are unquestionably wrong and the actions clearly criminal. ABVP have taken strong objection to the way Ambedkar Students’ Association (ASA) has conducted open prayer meeting for Yakub Memon and circulated posters in this regard particularly to the suggestion that ‘if one Yakub is hanged 1000s of Yakubs will rise’. More than the party politics of and on campus we see it as an issue impinging the moral and ethical fabric that constitutes our society – nation and nationalism, wherein an open support for a convicted terrorist and defiance of the Supreme Court is nothing but contempt of court and anti-national. This public positioning and our counter campaign against the propaganda about Yakub being hanged for being a Muslim has exposed the politics of hypocrisy and hatred of ASA, which as an organisation is dismissive of nation and nationalism and basing it on caste and identity politics. We oppose ASA for not being pro-dalit and adivasi students association but for its methods and orientations that is nothing short of unwarranted aggression in the name of assertion and equality, contempt and hatred for all except them in the name of protecting particular social groups (threatening and intimidating dalits who subscribe to other political ideologies is one of their main political activity) and disintegrating the idea of unity in diversity that underwrites India as a nation-state in the name of narrow caste politics (paradoxically it is the identity politics of subaltern elites that they practice!) geared at pecuniary benefits rather than any tangible re-organisation and re-alignment of material conditions and mentalities. 1. Disrupting the lecture of Prof Amartya Sen, no action taken! 2. Disturbing a national seminar conducted by Department of Telugu. The mob was led by Prabhakar (former President of ASA), Vincent Benny (current President of Students Union) and Prashant (former President of Student’s Union). Action- No! 4. Beating an activist of ABVP for stopping another ASA activist (Rohith Vemula) from tearing the posters of ABVP on July 2015. The omissions and inactions of the disciplinary mechanism of the university has encouraged violent tendencies within ASA and this has made them believe that this is the rightfully way to pursue their goals and politically engage individuals, groups and organisations with contrary ideas and ideologies. ABVP has great respect for Ambedkar and it is ASA which has insulted the great man by not only supporting a and also organising a mob attack attacking freedom of expression. •	How do you justify your action of going to a students room at 01.30 am to seek ‘justice’? Are you different from khap panchayats and dominant caste class group who deploy this method of justice? •	If you can criticize and oppose everything and everyone then you should be liberal and democratic enough to accept criticism and opposition. •	ASA is not the only voice of Ambedkar and Dalit’s so criticism about ASA is not criticism on Ambedkar and Dalit’s. •	Politics of violence whoever practice will be condemned. Attack on him is a consequence of an unchallenged growth of violent tendency on campus aided by the failings of the university administration. Moreover, it is an attack on the liberty and freedom of an individual who wants to record and register protest regarding issues on and off campus. ABVP have taken strong objection to the way Ambedkar Students’ Association (ASA) has conducted open prayer meeting for Yakub Memon and circulated posters in this regard particularly to the suggestion that ‘if one Yakub is hanged 1000s of Yakubs will rise’. More than the party politics of and on campus we see it as an issue impinging the moral and ethical fabric that constitutes our society – nation and nationalism, wherein an open support for a convicted terrorist and defiance of the Supreme Court is nothing but contempt of court and anti-national. This public positioning and our counter campaign against the propaganda about Yakub being hanged for being a Muslim has exposed the politics of hypocrisy and hatred of ASA, which as an organisation is dismissive of nation and nationalism basing it on caste and identity politics. The omissions and inactions of the disciplinary mechanism of the university has encouraged violent tendencies within ASA and this has made them believe that this is the rightfully way to pursue their goals and politically engage individuals, groups and organisations with contrary ideas and ideologies. “We hope the UoH will show courage in handling separatist and radical elements and ensure there is peace and harmony in the campus.” Good Said Arisebharat. In Kirori Mal College (Delhi University), screening of “Muzaffarnagar Baaqi Hai” documentary is disrupted by ABVP. The director was assaulted and the audience were abused. Ambedkar Students’ Association condemned this fascist attack on ‘Freedom of Expression’ and organized a protest against this anti-democratic act of ABVP. The president of ABVP-HCU, Mr.Susheel Kumar has posted a status in Facebook saying that “ASA Goons talking about hooliganism with emotions (Feeling funny).”ASA in University of Hyderabad is known for its historic anti-castiest, anti-brahminical and for the struggles it did for student rights. What happened on 04th August, 2015 night? After reading the FB status, ASA committee, called up him in order to ask him what prompted him to post such a derogatory status. He avoided the calls. In the evening, he was not in the room. In the night when we learnt that he came back to room, we called Chief Warden, DSW and Chief Security Officer to come and deal the issue. The authorities sent the In-charge security chief of the night,and then Susheel was questioned about the status in front of NRS-Annex in presence of the security. He said that it was a counter for ASA’s protest on screening disruption. We objected for him terming ASA members as Goons. We demanded an apology. He agreed to it and wrote an apology there itself. The security chief also signed on the letter as a witness confirming that there was no kind of manhandling happened at the spot. Then we asked him to post the letter in the comment section of the derogatory status so that people will get to know about it. He agreed. Security took him to main gate security post and from the computer there, he posted it. We returned back to our hostels. When we opened FB, we observed that the foxy Susheel has deactivated his account. We went again to main gate post. Security told that a Swift car has come took him away. Security was there until he left the campus. Only in the morning we learnt that he has admitted in a hospital to frame a fake complaint against students and to fuel a communal atmosphere on campus by involving BJYM, which blocked the main entrance to University. Later Police, in the name of a statement to be taken, have detained Students’ Union President, Vincent and ASA President, Dontha Prashanth and Dara Ashok Kumar (ASA). The ABVP brought the BJYM members and blocked the main gate on 05th August morning. After deliberations from administration, they moved to the administration and did a protest demanding action on the students they mentioned in the fake case. The ABVP cadre hurled abuses against Babasaheb Dr.B.R.Ambedkar, Dalit movement and ASA. They threatened that the ASA members will be beaten with slippers. They gave warnings saying that they are in power now and will see our end. But, the unity of all student groups (except ABVP) proved that communal forces cannot be tolerated. ASA thanks SFI, DSU, TSF, BSF, NSUI, TVV, OBCA, and concerned students who have extended their support in the fight against Right Wing Forces. On 02nd August 2015, ABVP at Delhi University stalled the proceedings of Screening a documentary ” Muzaffarnagar Baaqi Hein” directed by Nakul Singh Sawhney organized at Kirorimal College, Delhi University. Against Such Disruption, 03rd August 2015, Ambedkar Students Association (Asa Hcu) staged a protest demonstration against ABVP attack on Screening “Muzaffar Nagar Baaqi Hein”. On 03rd August 2015, Mr Nandanam Susheel Kumar, has written a post “ASA GOONS are talking about HOOLIGANISM, feeling funny”. The remark was completely objectionable, since ASA consists of SC/ST/OBC/Minorities, it was a direct comment on all of us, terming as “Goons”. Hence we went to ask a clarification from Susheel on terming us “Goons” for which he could not respond properly. In the presence of Security Officer Incharge on that night, Mr.Susheel withdrawn his words and has given a written apology for writing obnoxious comments. In this whole episode there was no physical attack against Mr. Nandanam Susheel Kumar. A High drama started, after giving an apology letter. Vishnuduth , Mr. Susheel’s brother, who is a member of BJYM, came in a car to pick up susheel from security office, admitted him in hospital with an intention to file Attempt to Murder case against ASA members. Subsequently, Vincent Benny, Dontha Prashanth and Ashok Kumar were called to police station for interrogation on the false complaint of attempt to murder. We were detained in the station till 05:00 PM even after submission of statement. ABVP, BJYM have misinterpreted the entire issue, and circulated false rumours on beating Nandanam Susheel Kumar and staged a protest at the Main Gate and administrative building. All Student organizations except ABVP ( ASA, SFI, DSU, BSF, TSF, NSUI, OBCA and TVV) have staged a Protest against detention of students and action against Nandanam Susheel Kumar for fabricating the issue with an intention to create communal tensions on campus, and facilitating the entry of right wing political organizations. Later by 05:00 PM, the detained students Vincent, Prashanth, Ashok were released by ACP, CI of Gachibowli PS. At campus, the movement continued for action against Susheel Kumar, and subsequently, the matter was handed over to Extended Proctorial Board. In line with our policy to facilitate discussion and freedom of expression , we welcome diverse opinions. It is sad that you don’t give the same freedom to fellow students. In one of your other responses, you have used derogatory words which is shameful. The posters clearly show that it is in support of Yakub Memon’s hanging. By attributing the protest to “Muzaffarnagar Baaqi Hein” is a clearly a diversion strategy. Secondly, when there is a proctorial board, what was the need for 40+ students to go the student room in the night. By supporting terrorists under the name of Ambedkar Student Association, you are insulting Babasaheb Ambedkar’s legacy. We hope the UoH will show courage in handling separatist and radical elements and ensure there is peace and harmony in the campus.